Our dogs live in our home with us. They relax on our couches, sleep in our beds, and pretty much have control of the television as well Our dogs are members of our family and are treated as such each and every day. Our dogs do not live in a typical envisioned kennel situation. 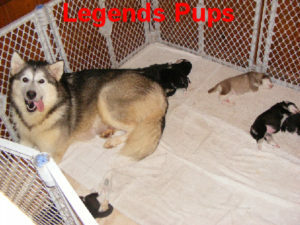 We use the term “kennel” in Legends Kennel because our whole house is a kennel. We live in our dogs world Our dogs are house dogs not commercial breeding kennel dogs. When our dogs are retired from breeding we do not give them away or sell them. They live their whole lives with us. Again, they are our family. Our puppies are born and raised in our home with someone always around. Our puppies are socialized with adults, children, other dogs, and cats. We socialize our puppies with all kinds of things (noises and experiences) that will prepare them for their new home. Our puppies are also pretty much house trained by the time they reach 8 weeks old. Of course they are babies and do have mistakes (baby bladders and systems = boo boos sometimes). Of course your new baby will need to adjust to your schedule as it may be different then ours. We do crate train our puppies as well so you will not need to listen to howling all night long when your new family member arrives. He or she will welcome the crate to get a good night sleep. 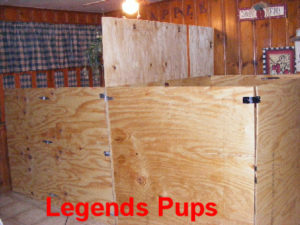 Dogs are den animals by nature and view the crate as their den. It is very comforting for them. Puppies come with a LIMITED (no breeding rights) AKC registration. We do offer FULL (breeding) rights for an additional $1000.00 to breeders we feel share our same philosophy in breeding practices. In order for us to consider granting you full registration we do have an additional breeder request application you must complete. We DO NOT grant full registration to just anyone. 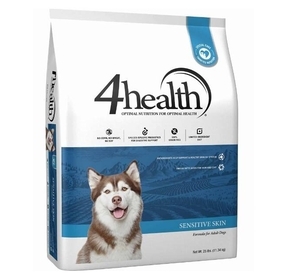 Our dogs are of the highest quality in health, temperament, and size. If you are just looking to breed because you think you will make a fast buck (of which you are very wrong) there are plenty of breeders out there who will grant full registration rights to anyone willing to pay for them. Our puppies have a 2 year tailored genetic health guarantee and are microchipped. Our veterinarian microchips our puppies. 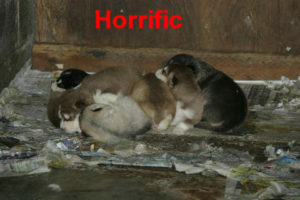 Most breeders microchip their puppies themselves for no other reason then to save money. We do not breed for money and go to every measure with cost not being an issue when it comes to our dogs and puppies. We do not, have not, and never will cut corners when it comes to the health and well being of our dogs and puppies. Imagine what a poor puppy feels when a breeder microchips them. The end of a microchip injection needle is the size of the end of a pencil. REALLY BIG. We use quality microchips that are readable by every brand scanner. Most “rinky dink” chips used by breeders are not readable by all scanners. If your pups chip is not readable, what good is it? We do not remove the dew claws of our puppies. There is much debate regarding the removal and our own personal preference is to leave the dew claws intact, they are there for a purpose. We are here to offer a lifetime of support and knowledge at anytime you need us. We produce all colors and coats. Our prices range from $1800 and up. Occasionally we will have a pup at a discounted price (ex: maybe a home fell through at the last moment, maybe a perfect pup was unable to find a perfectly matched home). 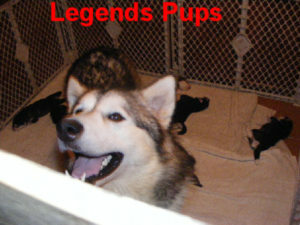 Legends Giant Mals produces some of the largest Giant Alaskan Malamute puppies in the world. Through selective breeding practices and the proper bloodline outcrosses we have been able to produce the most amazing puppies available. While it is true that all Giant Alaskan Malamute breeders do work off of the same bloodlines no matter where the breeder resides (yes, even Alaskan Malamutes from Alaska, Canada, & all the states have the same bloodlines). Our breeding practices differ from most other breeders in that we only breed the best through careful and responsible selection. We do not just take any two dogs and produce puppies. 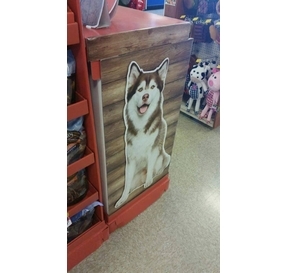 We have a goal and that goal is produce true to form the health, temperament and massive size of the original M’loot Alaskan Malamute. One of our males The Arctic Wooly Bully of Legends Giants Mals is perfect example of what we produce and intend to build upon. He is currently one of the largest living Giant Alaskan Malamutes. A $500.00 nonrefundable holding fee is required to hold your pick order for your puppy (if picks have already been made and there are remaining puppies a $500.00 nonrefundable holding fee is required to hold your puppy). 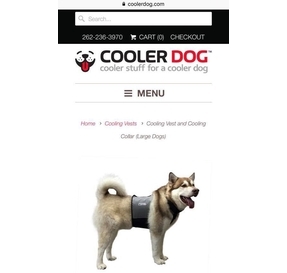 This $500.00 comes off the price of your pup. 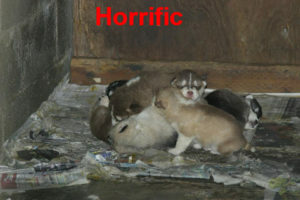 Puppies are picked in the order that holding fees are received. 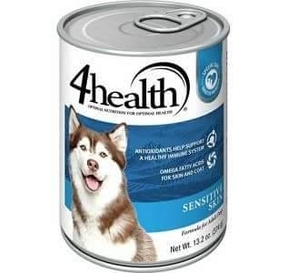 Pick choices are required between 2-3 weeks of age to ensure the puppies have a healthy start. The balance is due either at six (6) weeks of age if not being picked up and due upon pick up when picked up. If having a puppy transported, transportation fees are due one (1) week before transport. Puppies that are picked up must have the balance paid in cash. NO CHECKS. Puppies are ready for their new homes between 9-10 weeks of age. Under no circumstances will a puppy ever leave before 9 weeks of age (this is for the health and well being of the puppy)!! 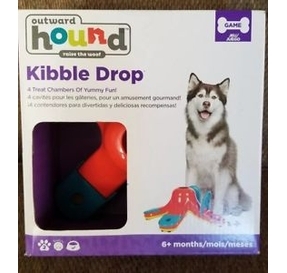 Transportation is approx $450.00 (depending upon pups age, weight, and method used) and includes everything needed (there is no additional expense.) We offer transport to the lower 48, Alaska, and Canada. Other international shipping will be quoted based upon the country requirements. We accept payments via various methods including direct billing your credit card in the event you wish to remove a 3rd party payment processor….ex PayPal. If you have any questions that we did not cover please feel free to ask. We are always adding to this page and updating to include new information.